travelling in Cornwall and Wales or in the studio in the Swedish countryside. There are fans in USA and Asia as well as in many European countries. RadioIndy created a CD Announcement Press Release for ad dios on Digg.com! "A Journey Through Middle-Earth" Reviewed by RadioIndy.com! Inspired by J.R.R. 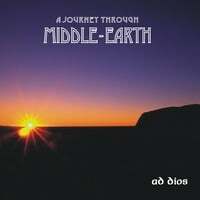 Tolkien's Lord of the Rings series, "A Journey Through Middle-Earth," the new CD by Ad Dios, is a terrific diversion into musical fantasy. Combining basic acoustic instruments with trippy electronic notes, this album takes the listener's mind out of the box at an easy tempo. Named after the setting of the Lord of the Rings saga, the opening track, "Middle-Earth," sets the stage with looming melodies, coupled with bongos and chimes progressing from soft to powerful. Toward the end, the track "Rohan" invests the listener with the feelings of LOTR’s main human character (Rohan) with electronic, regal-sounding trumpets and a steady bass line. If you're one that loves easy listening, then this is most definitely a CD for you. Just turn it on and let Ad Dios do the rest.